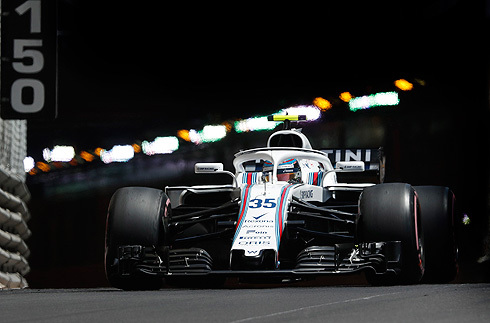 The results of the 2018 Moanco GP would see the Williams Martini team drivers finishing in an extremely disappointing 16th and 17th with Seregey Sirotkin leading Lance Stroll. 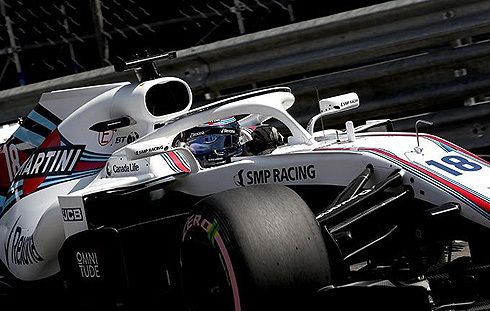 For the Williams team their difficulties started even before the lights went off with Sergey having a problem with a wheel assembly and would not have his wheels fitted before the three minute deadline. As a result he would receive a 10 second stop and go penalty effectively ruining his race. 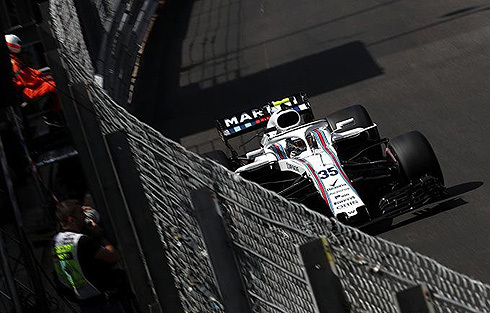 For team-mate Lance Stroll his race was marred by a puncture that saw him forced to pit dropping him to the rear of thye field. After their issues neither drivers race would improve and neither driver could make any progress. 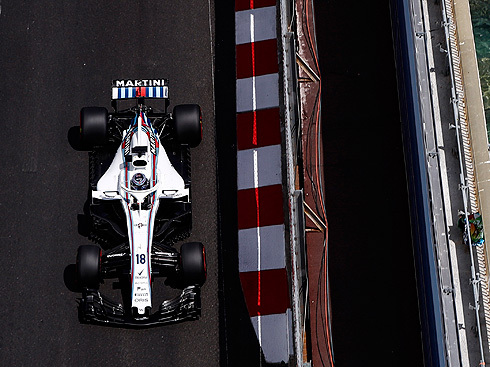 The grid for the seventy eight lap 2018 Monaco Grand Prix would see the Williams Martini team have their drivers line-up in thirteenth and seventeenth with Sergey Sirotkin leading team-mate Lance Stroll. On pole was Ricciardo from Vettel, Hamilton, Raikkonen, Bottas, Ocon, Alonso, Sainz, Perez and Gasly tenth. After failing toi set a time in qualifying Verstappen would start from last. The race would start under cloudy conditions with a small amount of rain falling prior to the cars coming onto the grid. The top ten cars would all start on used hypersoft tyres while the Williams drivers would see Sergey start on new ultrasoft tyres and Lance was on the ultrasoft tyre so he would go longer before his first stop. It was a mix of the hypersoft and ultrasoft tyres. The cars would complete their installation lap and would form back up. There had been an issue with Sergey's car with his wheels not all fitted at the three minute mark. It was under investigation. It would be clean start with Ricciardo leading from Vettel and Hamilton. For Williams Sergey were now running in 12th and Lance 16th. Lap four and Ricciardo was leading by 1.7 seconds over Vettel. Sergey was running right behind Hulkenberg and Lance behind Hartley. It was announced that Sergey would get a ten second stop & go penalty for the issue with his wheels. Sergey would pit for his penalty dropping to last. Lance would get past by Verstappen and things would go from bad to worse for Williams with Lance having an issue with his left front puncture seeing him forced to pit. This would see Sergey and Lance running 19th and 20th. At his stop Lance had changed to the supersoft tyre. Lance had to take to the chicane runoff to let a group of midfielders past to lap him. Lance's puncture was caused by him making contact with Ericsson's Sauber. After the first series of pit stops from the leaders it would still be Ricciardo leading from Vettel, Hamilton, Raikkonen, Ocon, Alonso, Bottas, Perez, Gasly and Hulkenberg. Ocon, Perez and Alonso had yet to pit still running on the hypersoft tyre. Sergey had moved into 18th but would have to make another stop. Of the front runners Bottas and Alonso were on the supersoft tyre. Sergey would pit again on lap twenty seven. he would come back out in 19th running on the ultrasoft tyre. The final stops would be completed and it would be Ricciardo from Vettel, Hamilton Raikkonen, Bottas, Gasly, Hulkenberg, Ocon, Alonso and Verstappen tenth. But at the front Ricciardo would say that he was losing power. Vettel was able to close the gap to the Red Bull while for Williams the pair were still running at the rear of the field. Gasly in sixth had completed forty laps on the hypersoft tyre. For Lance on lap forty eight he would have another front left puncture seeing him pit again. He would take a new set of hypersoft tyres. Lap fifty and Ricciardo despite his engine situation was able to keep in front of Vettel and Hamilton. Hulkenberg would pit seeing him dropt o tenth with Verstappen right behind. Alonso would retire with a gearbox issue pulling off in a safe place. Sergey had also pitted fro a new set of supersoft tyres which should see him to the end of the race. The Williams pair were now 18th and 19th. The order would remain quite static and with ten laps remaining Ricciardo was still in the lead from Vettel, Hamilton, Raikkonen, Bottas, Ocon, Gasly, Hulkenberg, Verstappen and Sainz tenth. The Williams team continued their disappointing run at the rear of the field. 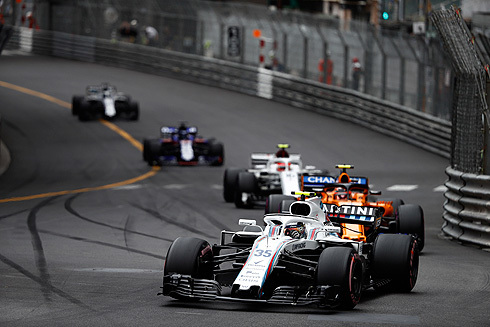 In the closing laps Leclerc would run into the rear of Hartley ending both their races. The Virtual Safety car would be deployed as Leclerc would say that he had no brakes. Harley would be forced to pit. This would see Sergey move up to 16th and Lance 17th. The Safety Car period would end and and Vettel would now be five seconds behind Ricciardo with a handful of laps remaining. The final laps would be completed and it would be Ricciardo who would go on to win the 2018 Monaco GP from Vettel and Hamilton. The rest of the top ten would remain in their order and for Williams they would finish in 16th and 17th. A race to forget for the Williams team with so many issues from wheels to punctures and penalties to deal with.